Ride the rails. Sharpen your golf swing. Discover the thrills of harvest season. Whatever is on your radar, Silverado Resort and Spa has a special deal perfect for your special trip. Choose from a wide variety of offers. Splurge on a day with your friends, or let loose after a couple rounds of PGA-caliber golf — The Spa at Silverado has you covered. Relax and rejuvenate amid the splendor of the Spa at Silverado, an oasis of tranquility and wellness in the heart of Wine Country. Indulge with a massage. Pamper with a body wrap. Go ahead, book some well-deserved me time with spa package. Choose the one that's right for you. Who's game for a getaway? Our golf packages offer a chance to stay and play on two championship courses. 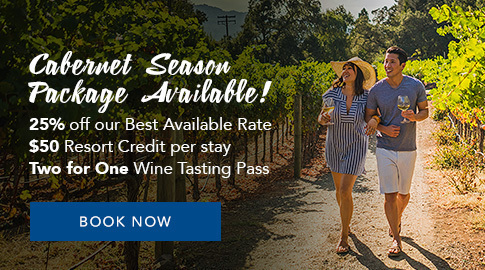 Available year-round, our "Just The Room" packages are your ticket to get out and explore all the Wine Country has to offer. Enjoy world-class tennis - and amp up your game on 10 plexi-pave courts - at Silverado Resort and Spa.